The Gulf of Spezia lies between the deepest inlets of the Tyrrhenian coast in the region of Liguria, featuring both mountain ridges and enchanting bays. Liguria, where the prominent port cities of Genoa and La Spezia reside, has long enchanted artists and writers with the beauty of its majestic landscape. The Gulf of Spezia earned its reputation as “the Gulf of Poets” over centuries as a favorite retreat of D.H. Lawrence, Hans Christian Anderson, Virginia Woolf and Dante, among others. Lerici, Portovenere, San Terenzo and Portofino are all known for their scenery, excellent seafood and literary history. One of the villages dotting the sea is Lerici, where writer and film director Mario Soldati lived. In earlier days, Percy and Mary Shelley resided there in their boat home, Casa Magni. Lord Byron, too, was drawn to this area, frequenting a grotto in Portovenere. Italo Calvino and Eugenio Montale were also known to have made their homes in the region. Lerici stretches out over the eastern side of the Gulf. An Etruscan city and an important port of call in Roman times, in the Middle Ages it was long the bone of contention between the Pisans and the Genoese. In the 17th and 18th centuries noble ship-owning families built luxury palazzos and villas there. The village is dominated by the Castle, considered one of the most beautiful in the whole of Liguria. It was built in several stages between the 13th and 14th centuries and remains in excellent condition. The castle houses the fascinating Museum of Geo-Palaeontology, with reconstructions of prehistoric scenes, reproductions of dinosaurs, marine and land fossils and a seismic simulation room. 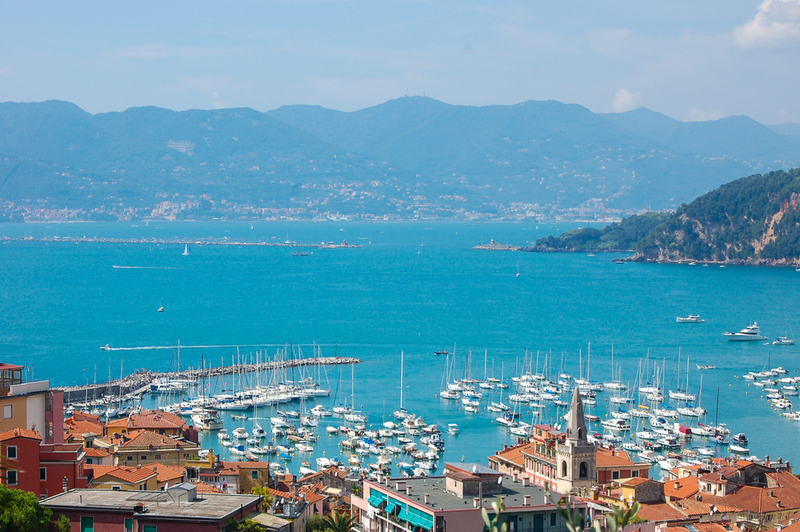 Lerici is one of the favorite destinations of sea sport enthusiasts. In the protected bay you can see dozens of sailing boats, windsurfers, canoes and catamarans. All along the coast are superb views of reefs alternating with small stony or sandy beaches. The shoreline is clean and well looked after. Many beaches along the coast have been awarded the Blue Flag, a voluntary eco-label awarded to more than 4,000 beaches and marinas internationally and signifying high standards for water quality, environmental management and safety. Just ahead of Lerici, positioned beautifully above the bay, lies the small town of San Terenzo and its 15th century castle housing a museum dedicated to Mary Shelley. The castles of Saint Terenzo and Lerici are connected by a picturesque walkway. 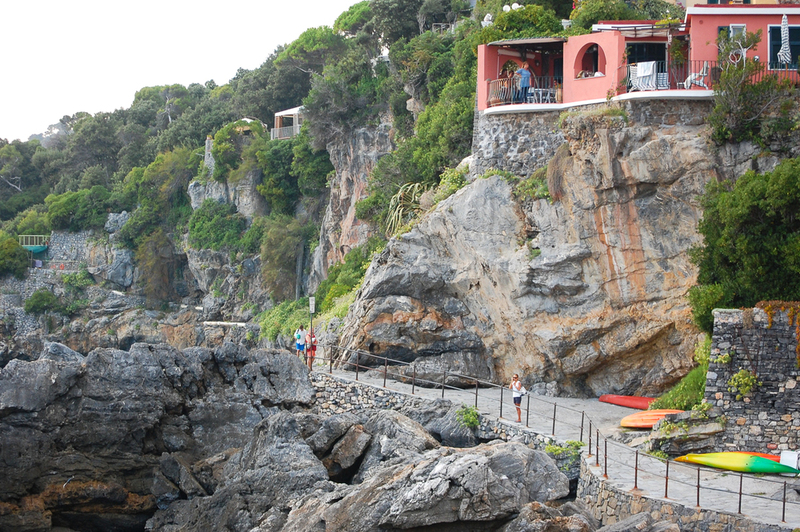 The medieval village of Tellaro rises up on the rocky tip of the eastern extremity of the Gulf. Tiny Tellaro is a model of Ligurian town planning: the walls surround the village with its narrow carruggi or alleys and pastel tower-houses, while the church of Saint George, dating back to the 1500s, dominates the village square. 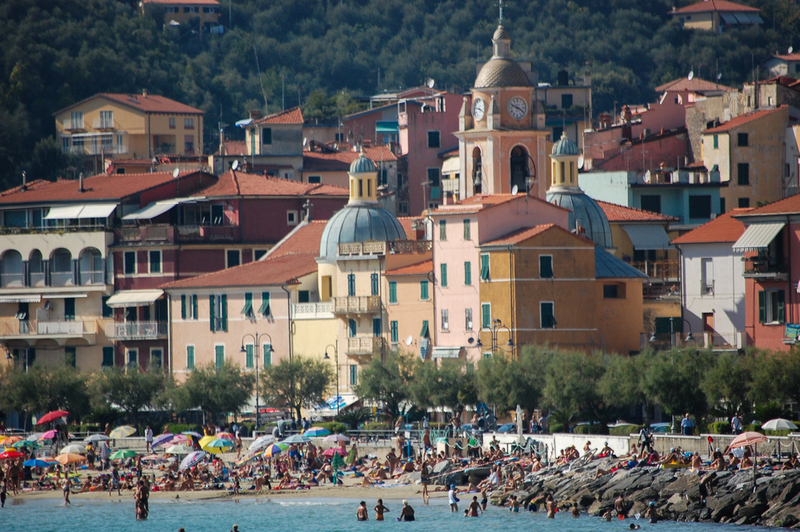 Tellaro is considered a hidden jewel on the Gulf of Poets; removed and secluded, but well worth a visit. It has remained peaceful and unspoiled, despite recently having been awarded "Borgo tra i cento piu belli d'Italia," ranking it among the 100 most beautiful villages in Italy.